This page links to the various blog posts that explain how I used mtDNA to attempt to answer the question “Who were Charlotte Richardson’s parents?” I did this research in 2016 and presented my findings at the British Isles Family History Society of Greater Ottawa (BIFHSGO) annual conference in September 2016, on a panel called “Making Connections: Adventures in Genetic Genealogy”. This is an adaptation of that presentation. Thank you for such a well-presented five part piece on using mtDNA! I am sending the link to a fellow-researcher who shares my mitochondrial line at gd = 0. We have six others who match us and we all follow our respective lines to eastern New York State by 1800. I am the only one who follows mine to 1685 Rhode Island and I want to know who her mother was!!! 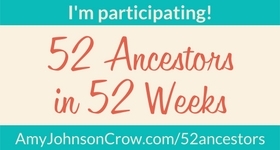 I have worked with doing the research for some of my matches (with some success) to try to get them back to Rhode Island; and I have followed my ancestress’s sisters forward inasmuch as possible. It’s a work in progress but I love it. Every time that I hear/read someone say that mtDNA testing is useless I want to yell, “Wait a minute! !” You have now done that most elegantly. I suspect I will use the link to your case study quite often. THANK YOU. Thanks so much! I’m glad you find it useful!